When we asked a number of art educators to send us their favorite multicultural art projects, we honestly didn't know what to expect, so we were very excited to receive the colorful and insightful projects featured below. The 12 different lesson plans were written by the teachers themselves, so you can be sure each one has already been tested and found to bring a satisfying classroom learning experience. Art has always played a significant role in shaping and recording our cultural history and lifestyles; teaching it from this perspective has become an increasingly necessary discipline in our ever shrinking world. We sincerely hope those of you in the educational field will be able to take advantage of these projects and incorporate them into your curriculum. Review of Native American Indian Culture. 2000 years ago, the Anasazi Indians inhabited the cliffs of the Southwest. They left Petroglyph drawings on rocks and cliffs. Students will learn more about this culture as they draw depictions of these symbols. The stenciled hand print and aboriginal style drawings help children to relate to the man from the Australian Aboriginal Culture, while helping them to understand the use of line in art. Molas are the brightly colored applique panels made only in the San Blas region of Panama by the Kuna Indians. Once the paper Molas are completed, have the children discuss their importance to the Kuna Indian women and their culture. The Huichol (pronounced Wee-chol) people inhabit the most remote parts of north central Mexico. Students visually describe an especially significant summer event in their lives using yarn paintings, which the Huichol people continue to use today as a testament to the whole of their religious and cultural beliefs. Introduces students to a Chinese art form, where students learn the tools used to make ink paintings, form brush holders and small pots in clay, and enjoy painting several compositions using brush stroke techniques. There are 20 Pueblo villages left in the Southwest; there were at one time in history 200. Each of the 20 Pueblos is famous for art and/or crafts, such as pottery. Students will learn about the Pueblo Indian arts and crafts, and emulate the famous pottery of Maria Martinez, who lived in a Pueblo. 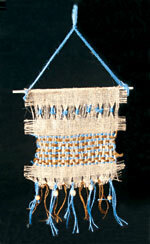 Students will learn about Native American craft art, basketry, rugs, clothes. 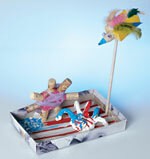 These crafts were decorative as well as utilitarian, made for everyday use and also for ceremonial use. 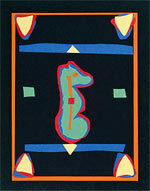 Students will also learn the use of symmetrical designs in Native American art. Students will repeat a design with handmade stamps. They will learn about traditional African fabric design, dyeing and decorative stitching. Rather than copy a traditional art form from another culture, students will be inspired by their symbols and techniques and apply those to their own images to make the work personally significant. "How Grandmother Spider Stole the Sun"
Students will be introduced to a Native American story, "How Grandmother Spider Stol the Sun", told by Joseph Brucha. They will use this to create a work of art out of clay and other materials, rather than paint and paper. Native American Indians are famous for their beautiful turquoise and silver jewelry and belts. The Indians, who were very close to the earth and spiritual people, believed that certain animals, birds, etc. possessed special powers. 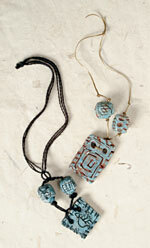 They would carve these spirit totems into their jewelry and then wear them for good luck. Students will be introduced to different examples of Indian jewelry.